When it comes to rehabilitating horses, or for me even just owning horses, I approach it with the whole horse in mind. For me my horses are companion animals, riding animals, and animals that I use to facilitate my business. They are also living, breathing beings with their own thoughts, feelings and needs. They make friends, have family groups and form attachments to certain horses, animals and people. My main area of focus in my business is hoof care, but in order to achieve optimal hoof health there are many other areas that must be working properly in order for the hooves to be healthy. Another huge factor is teeth. I recently went to Florida to further my knowledge and become a graduate of the Horsemanship Dentistry School. This was so important for me as I have always known there was a connection between what was happening in the mouth and the soundness in the body but I needed more information. What I learned was so mind blowing. An imbalance in the teeth will create an imbalance in the jaw that would translate to an imbalance in the neck, shoulders and feet. An imbalance on the front end will affect the hind end and so on. It becomes a cascade effect, and the best part is when I am able to feel an imbalance in the mouth, correct it and see a direct improvement in how the horse moves or behaves. 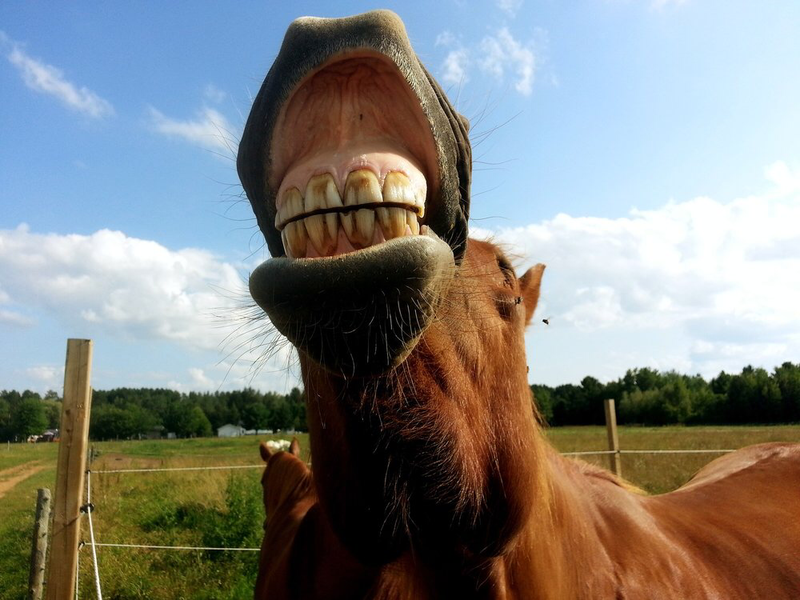 Horses are so innately in tune with themselves that even just a slight dental problem can have a big effect. The dentistry school I went to teaches manual balancing without the use of sedation so that you can watch the horse respond to the changes you make. I have never quite done anything else as intimate and rewarding with my horses as putting my hand inside their unrestricted mouth. With no speculum to protect me, and no sedation to alter their state of mind, I can remove any sharp points inside their mouths and watch them lick and chew and feel the area with their tongue. That is usually followed by them pressing their head into my chest with thanks. No joke, this just gets my heart pumping. The last thing I will touch on in our whole horse approach to health is riding and the subsequent muscle development. Riding can play a huge part in the health of your horse’s hooves. For instance, a balanced horse that is ridden round (not over bent) will be travelling in balance from the front end to the hind end and engaging their core muscles and therefore loading their hooves optimally. A horse ridden hollow or unbalanced will create unbalanced forces on the hooves and therefore may not wear evenly. A horse ridden very over bent will travel with too much weight on the front or hind end and not travel in a balanced manner. How the horse is conditioned to riding will also affect how he will move in the pasture or paddock. Wild horses are conditioned to move 20-40 miles per day on varied terrain and tend to build well balanced bodies and hooves. When we keep horse in domestication we inhibit their ability to move freely and they don’t always understand how to move properly because of this. We must teach them how to carry the weight of a rider and still move in balance and harmony. How crucial is the time interval between trims? There are many things to consider when determining how long to go between trims. In this geographic area the standard trimming/shoeing cycle is approximately 6-8 weeks. My own scheduling is usually based around a 4-6 week cycle, though I have the odd horse or group of horses that go a little longer. What I want to discuss in this blog is a much shorter trimming cycle that is favoured among some very successful and highly respected farriers/trimmers that I follow. What I am seeing and learning from them is that a shorter cycle is far better for the horse, and the overall health of the hooves and therefore the body and mind (My whole horse approach to health will be featured in an upcoming article) of the horse. First lets think about the ultimate goal we have in trimming our horses hooves. For me it is to mimic the wear patterns that are demonstrated by the wild horses of the US Great Basin and other dry desert dwelling feral equines. These equines are clinically sounder then our domestic horses and have virtually no instances of founder, navicular disease and many other hoof pathologies we see so commonly in our domestic horses. So if we can apply that principle to our trimming, our mandate would be to trim in order to mimic natural wear over varied terrain. So then the correct trim schedule would have to be based on each horse’s individual hoof wear. Because the hoof is in a perpetual state of growth, this means that immediately after trimming the hoof is already replacing that (worn) material that was removed. The goal then should be to allow the hoof to grow to the optimal length and thickness required for that individual horse. It should then be trimmed again just before it grows past optimal to a leveraging state. If it is allowed to grow too long the forces during impact and movement will start to distort the hoof. When trimming we will then have to perform what is called a rehab trim as opposed to a maintenance trim. 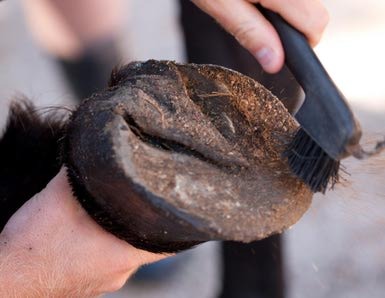 A maintenance trim means we are just trimming excess length, and that excess has not caused the start of any breakdown or distortion of the hoof. 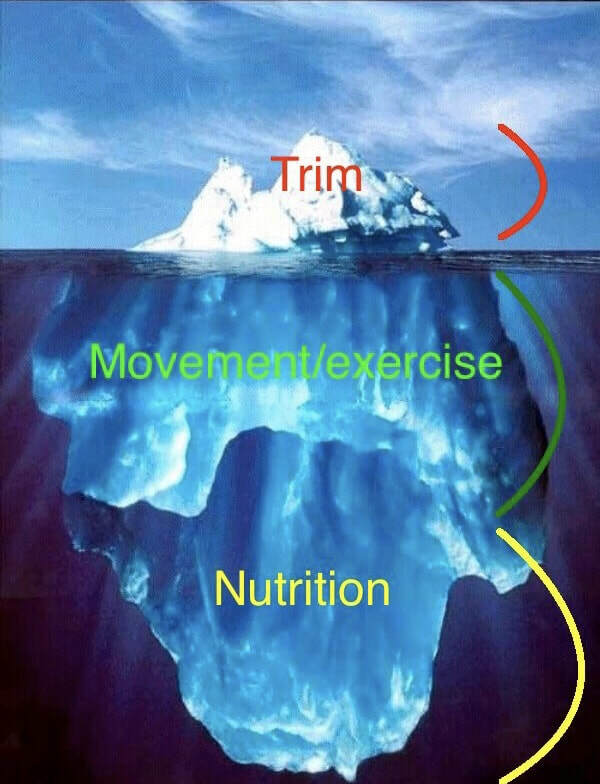 A rehab trim means that we are correcting pathologies or distortion usually caused by excess length. 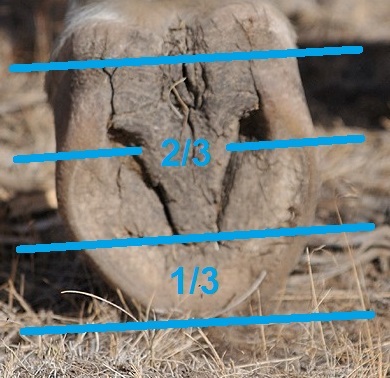 The hoof on the left shows a hoof that has grown excess length but is still balanced and not distorted. The overall length needs to come down and the break-over needs a new mustang roll, but otherwise this hoof is balanced, a maintenance trim. The hoof on the right is much longer, and has grown out of balance. The heels have moved forward and the toe is stretching forward. The frog is small and narrow and appears diseased in the central sulcus. Not an extremely distorted hoof but a rehab trim, not a maintenance trim. The shorter trim cycle will prevent distortion and instead more closely mimic natural wear. For most horses the trimming cycle that these farriers/trimmers are finding works best is 2-4 weeks, 3 weeks being the average correct cycle for most horses. It is important to understand that because these trims are closer together there will be less material to remove. On a 3 week trim cycle there would be little need for nippers, it would really just be a rasp to maintain balance and remove the excess and possibly some knife work if the bars or frog needed addressing. Where this interests me is with a select few horses I trim that are sensitive on hard or rocky ground immediately after a trim for about 3-5 days. Not sensitive in their paddocks or living environments, but sensitive being ridden on unforgiving ground where they otherwise would have been fine. 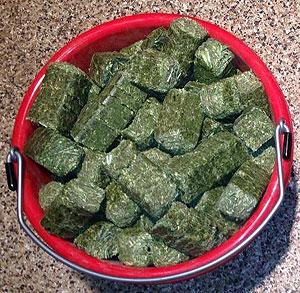 What those horses need is for me to leave a little more material at the trim, but because I won’t be trimming them again for 4-6 weeks if I leave that extra material we are at a point of distortion before the next trim and then we are back to rehab trims as opposed to maintenance trims. However if I could trim less, and then trim the horse again in 3 weeks there would be less instances of sensitivity after the trim and less instances where the hoof gets to that distortion point before the next trim.. This is easy for me to process, however it becomes a challenge when trying to help horse owners to understand that trimming less more often is in the best interest of their horse. For the horse owner it means they are paying for trims twice as often, seeing much less of a difference in the before and after of the trims, and they are having to schedule me twice as often, taking up their valuable time. My goal is to make this process easy and beneficial for everyone. I have started a pilot project with a few clients where I am trimming their horses every 3 weeks, and evaluating the horses’s comfort levels before the trim, immediately after and at the end of the 3 week cycle. I am also looking for any hoof distortion (if present) in order to determine the optimal length of cycle for each specific horse. I am working on a price structure that includes a reduced cost for horses that are on a maintenance trim schedule vs those that are in a constant cycle of rehab trims. 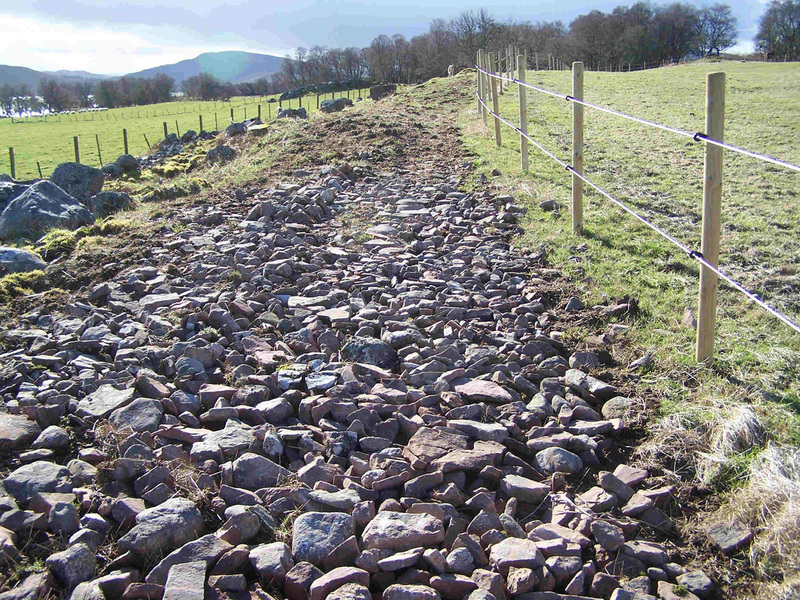 This would make trimming at these shorter intervals more cost effective and because there is less material to be removed the trims would take less time. Ultimately the biggest advantage of the shorter cycle is for the horse. The closer we can mimic the natural wear pattern of the wild horse, the closer we can come to achieving the soundness seen in those wild herds and the virtually non existent hoof pathology that we so commonly see in our domestic horses. The photo above shows Ruby when she arrived in late March, the video below was shot July 15, 2018. Laminitis or Founder, Two terms that are often used interchangeably, but do you know the difference? The terms Laminitis and Founder are often used interchangeably by vets, farriers, trimmers and horse owners alike, however in my opinion they have two very different meanings. Laminitis is the inflammation of the sensitive lamina surrounding the coffin bone. This includes the sensitive lamina, found along the front and sides of the coffin bone, as well as the solar corium which is found on the bottom of the coffin bone. The sensitive lamina is the vasculature covering the coffin bone and it has nerves and a blood supply. The insensitive lamina is located on the inside of the hoof wall and has no blood supply or nerves and is semi-rigid in structure. The sensitive and insensitive lamina interlock like Velcro. This connection of the lamina supports the coffin bone’s position within the hoof. The sensitive lamina surrounding the coffin bone after the wall is removed. There are two kinds of Laminitis, Acute and Chronic (Founder). Acute Laminitis is when the sensitive lamina becomes inflamed and the blood vessels swell. This causes pain because they are interlocked between the leaflets of the insensitive lamina that are semi-rigid and this connection doesn’t leave room for swelling. The solar corium can also become inflamed during the acute phase and cause bruising and eventually abscessing. A horse with acute laminitis will be extremely tender in their hooves, reluctant to move forward and often adopts a rocked back stance. Acute laminitis will usually last 2-5 days, and must be diagnosed by your veterinarian, who will also likely provide short term anti-inflammatories and care instructions. They should also work in conjunction with your farrier/trimmer to try and alleviate hoof pain and prevent further damaging the hoof. You must figure out what triggered the laminitic attack in the first place in order to prevent it from happening again. 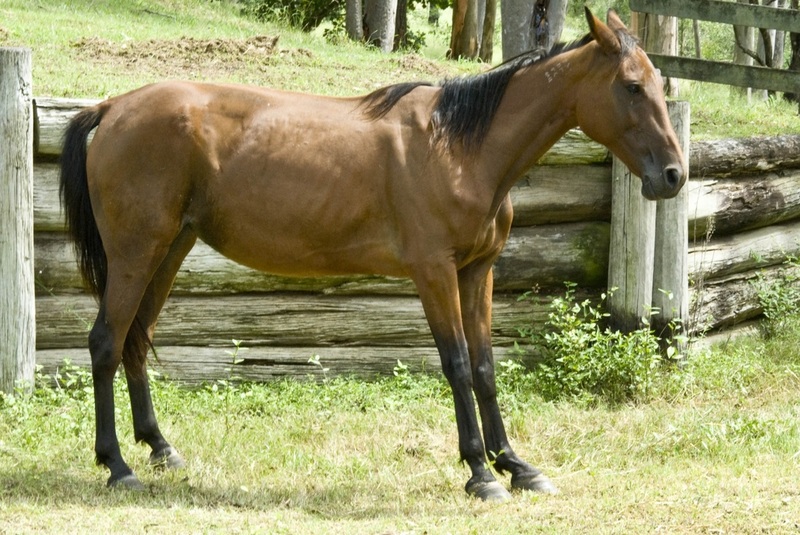 There are many causes for acute laminitis, some of the common ones are: carbohydrate overload (excess grain, green grass), hormonal changes (mares cycling in the spring), excess concussive forces (increased work on hard ground), over trimming, adverse reaction to medications, systemic infections, and stress. Chronic Laminitis or Founder as it is typically called, is the rotation and or sinking of the coffin bone within the hoof capsule. A horse can have acute laminitis and not founder if the triggers are removed quickly enough and the lamina heals. 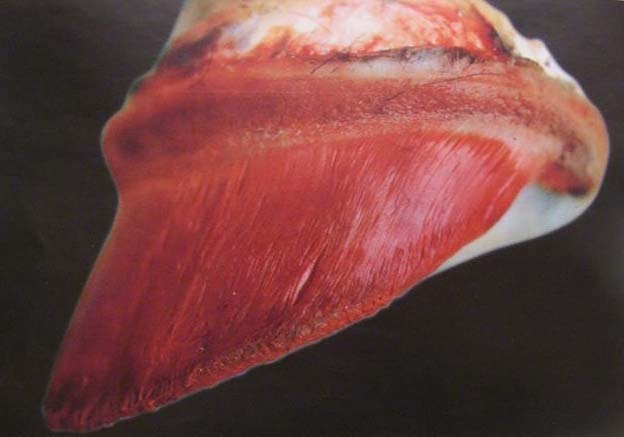 However, if the cause for the laminitis is not removed and the hooves are not properly trimmed and protected the horse can continue to suffer damage to the sensitive lamina which eventually lets go of the connection with the insensitive lamina, allowing the coffin bone to rotate and sink within the capsule. Whether it rotates one degree or ten, any rotation or sinking at all is classified as founder. 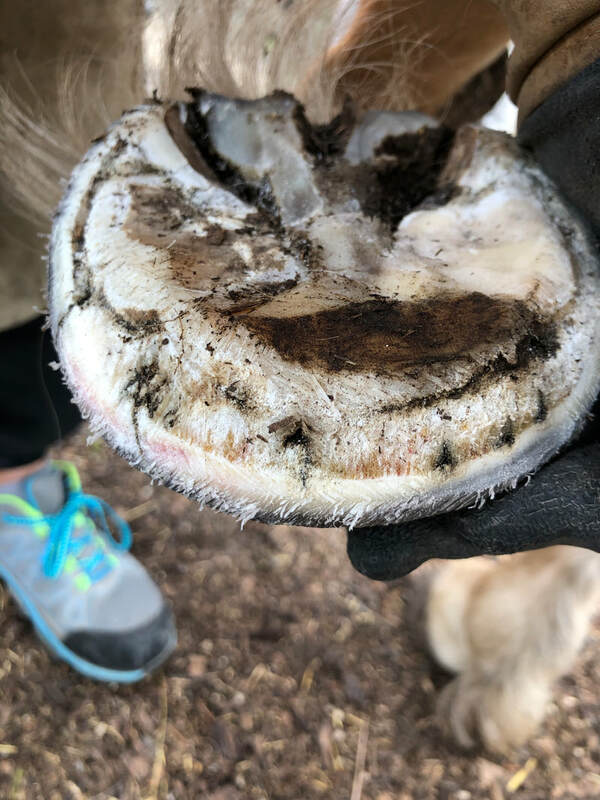 Once the lamina separate they cannot be immediately reattached, but the connection can be regrown down from the coronary band as new hoof wall grows in. 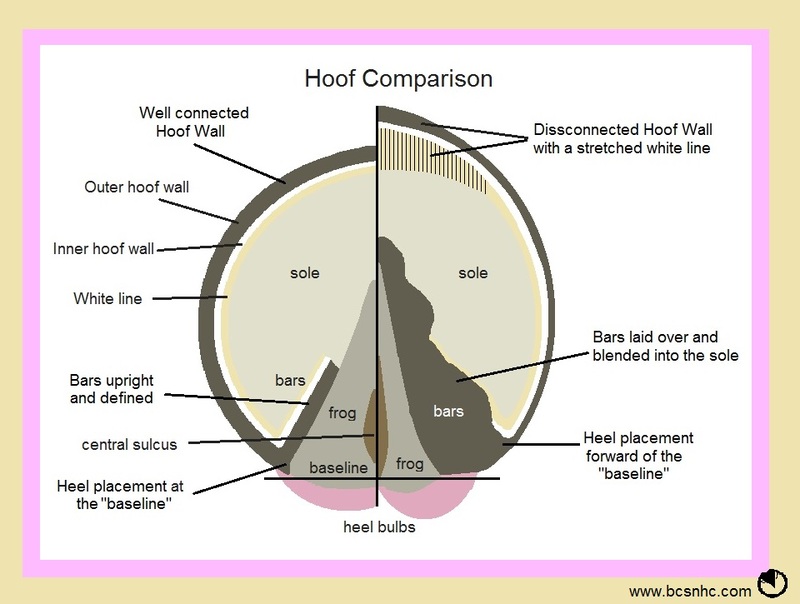 You will have to work closely with your farrier/trimmer in order to allow the hoof wall to grow in well-connected again, and often a shortened trimming cycle is necessary. It is a long process to rehabilitate a foundered hoof but it is possible. Founder is very common, and many horses live and even compete on foundered hooves without their owners knowing it. 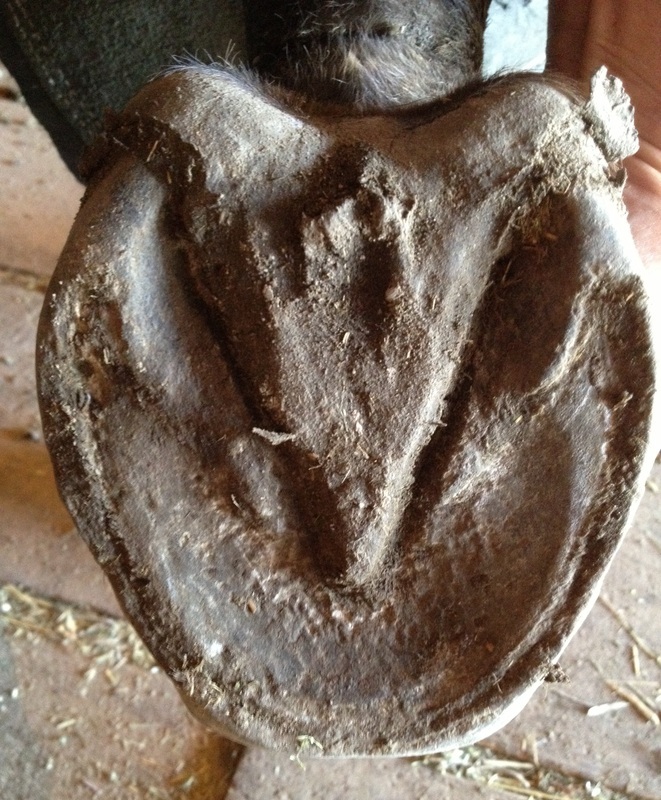 It’s not until these “timebomb” hooves eventually cause lameness that owners become aware. This is why education and knowledge become so important to the horse owner. 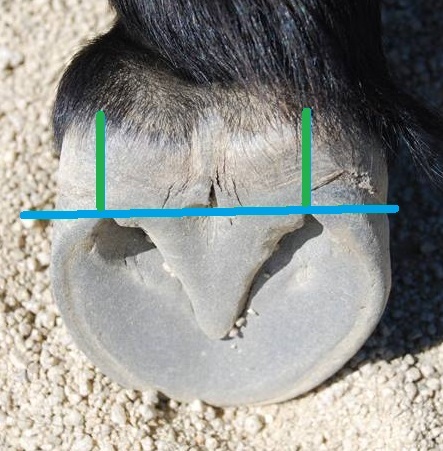 Learn to understand what you are looking at when examining your horse’s hooves and how to evaluate their hoof health to prevent and avoid these types of problems in the long run. Maintaining frog health through the winter can be a challenging task in our climate. A healthy robust frog is one of the main supporting structures in the back of the hoof. As the horse strides out the heels and frog impact the ground first, absorbing the impact energy and dissipating the forces on the horses’ joints. A weak or infected frog will cause the horse to alter its stride and can cause the horse to land toe first. This is detrimental to the functionality of the limb and can wreak havoc on hoof health as well as cause a myriad of body issues. A healthy frog is calloused and firm to the touch with no snags, flaps or crevices for debris and manure to get trapped inside. The central sulcus (small “V” shaped crevice at the rear of frog) should be shallow and wide. The collateral grooves (indented area on each side of frog) should be open and be easy to slip a hoof pick in for cleaning. If they are too tight your trimmer might open them up to allow you better access for cleaning during the wetter months. An unhealthy frog is one with flaps and tags of material that appears ratty and loose. In many instances thrush and other fungus and bacteria can get trapped in deep grooves and fissures creating further infection inside the sensitive. Once the frog and its underlying structures become infected it can be very hard treat and heal. A balance of cleaning with topical anti-fungal and anti-bacterial solutions as well as keeping the hooves clean and dry is the best remedy. 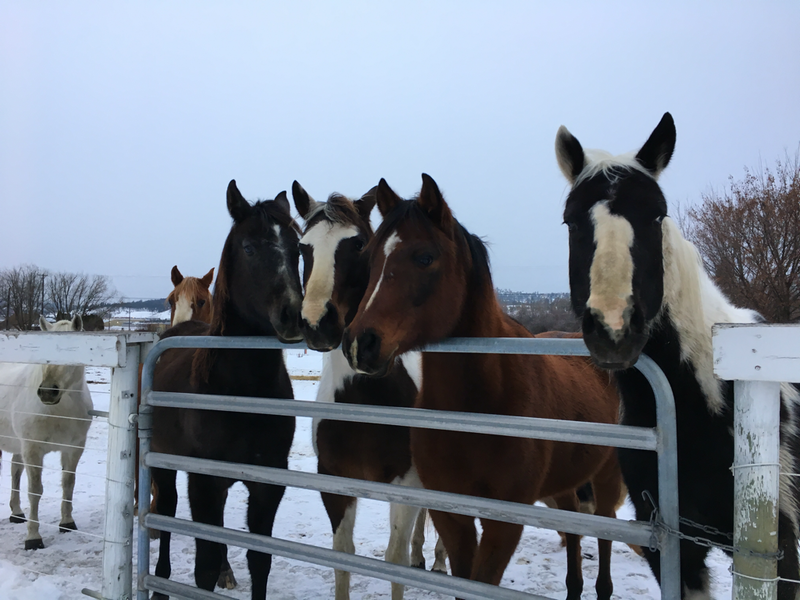 In the winter with the mud and snow manure management can be difficult, but keeping your horses’ heavier trafficked areas clean and dry is a priority as well as picking their feet regularly. A great strategy is to treat the horse preventively twice a week as the ground becomes wet with a mild anti-fungal like apple cider vinegar. The vinegar kills the bacteria and fungus but will not harm the healthy tissues. There are many products on the market for treating thrush, but whenever possible I prefer to recommend something natural when using it as a preventative measure. If you are dealing with an active surface infection the apple cider vinegar is still effective, but more frequent treatment is needed. My preferred method of application is to put the vinegar in a spray bottle or a bottle with a pointed tip to apply it only to the infected area. After applying I use an old toothbrush to massage the vinegar into any small cracks or crevices. Too much vinegar on the skin or heel bulbs could cause irritation or sensitivity and should be avoided. The aim is to apply only to the infected areas of the frog or hoof. For deep central sulcus thrush causing toe first landings or altered stride serious effort must be put into healing the hoof before lasting damage is done to the horse’s hoof, joints and body. In this instance I recommend a soaking boot and a solution called White Lightning. White Lightning is a liquid that when mixed with equal parts white vinegar creates a Chlorine Dioxide Gas. This gas kills the fungus and bacteria on contact without irritating the sensitive tissues that could be sensitive from the underlying infection. Soaking is recommended daily for 20 minutes until the infection is starting to dry up and the cracks can start to close. As the infection starts to clear treatment can be gradually reduced until the crack is healed. A word of caution: During soaking keeping the solution low on the hoof so that is does not irritate the skin is of great importance. The liquid can discolor the hair and can irritate the skin if left saturated for too long. A little solution goes a long way, on average I use 2 tablespoons of WL mixed with equal parts vinegar. It is also important to note that this solution must be mixed up on an as needed basis and will not be effective if mixed ahead of time. It is the chemical reaction that causes the gas and so the soaking boot should also be wrapped to trap the gas inside while soaking. An old polo wrap or vet wrap works well for this. With any medical treatment, consult your veterinarian or hoof care practitioner if you have any questions or concerns or if the infection persists. Another product that I recommend for thrush is No Thrush powder. It is the only thrush product on the market (that I know of) that is a dry treatment for thrush. The powder comes in a bottle with a pointed tip so that you can insert the tip into the crevices and expel the powder. This needs to be done daily, or in some cases multiple times per day in order to treat severe infections. I like to use this powder on an infected hoof and then as a base in a hoof boot in wet or muddy conditions in order to keep the hoof clean and dry. No Thrush is available to purchase through our online store. For central sulcas thrush with deep cracks I also use a cream made up of equal parts clotrimazole and triple antibiotic ointment. The clotrimazole is used for athletes foot infections and can be found at most pharmacies. I mix both creams together and put the mixture into a large syringe with a pointed tip. The syringe allows me to inject the cream deep into the crack in the frog and the cream kills the fungus and bacteria. This treatment is effective long term, but needs to be done daily and the hooves kept clean and dry. A liquid thrush product I use regularly to treat thrush and as a preventative is No Thrush. It is a deep purple color and works very well for surface thrush and as a preventative. I apply it to a clean, dry frog with a toothbrush so that I can scrub it into the frog and any cracks and crevices. Be sure to wear gloves and don't get it on your clothes as it stains everything it touches! Thrush Off is available online at http://www.well-horse.com as well as at most tack stores. There are a lot of interpretations of natural trimming, and every clinician seems to have their own method. What each of these methods have in common is their connection to the wild horse model. The wild horse model is simply a style of trimming based on the wear patterns on the hooves of the wild mustangs in the US Great Basin. Even though they don’t live the same untamed lifestyle, our horses’ genetics are the same as their wild relatives. Hundreds of years of selective breeding has not changed the genetic makeup of our horses. Science has proven that it takes between 5000 and 10000 years for evolution to change the base genetics of any species. While we do select specific traits to carry forward through our breeding practices, the genetic makeup of our horses is the same. In May of 2014 I traveled to the Steen Mountains of Oregon to study and observe the wild mustangs that live there. What I saw was amazing. Horses with strong, hard hooves, traversing extremely rocky and uneven terrain. They galloped over it as if they were floating. The mustangs were in peak health, muscled and toned and moving with impulsion and vigour. In the approximately 500 horses we encountered, fewer than 5 showed signs of lameness. These horses could traverse terrain that our domestic horses would stumble and trip over even with strongest of hooves and hoof protection. It gave me a great appreciation for how much more our horses could be capable of if only they were not held back by our ideals. The benefits of natural trimming with the wild horse as a model are many. The most important being that the hoof can expand and contract upon impact with each step. This the primary way the hoof dissipates the energy of impact, it also increases the circulation of blood through the limbs, reducing the stress on the heart. 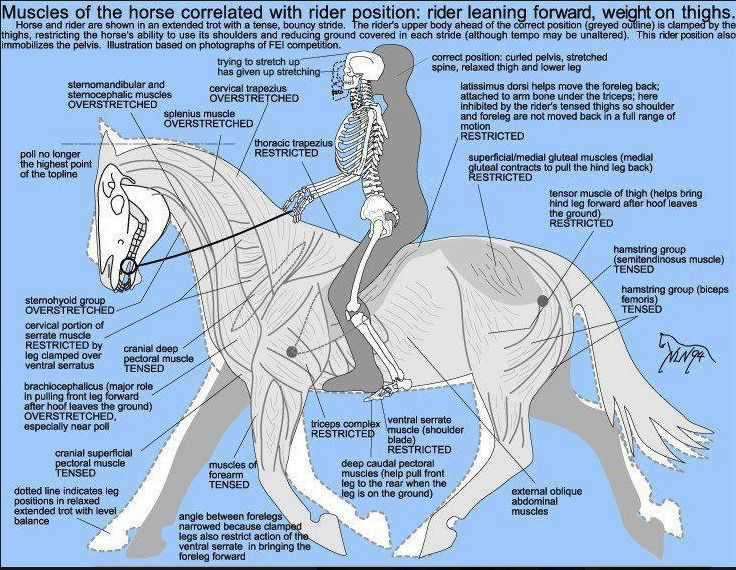 The horse will also have much fewer chiropractic, muscle and joint problems. It reduces the risk of tendon and ligament strain and damage significantly. 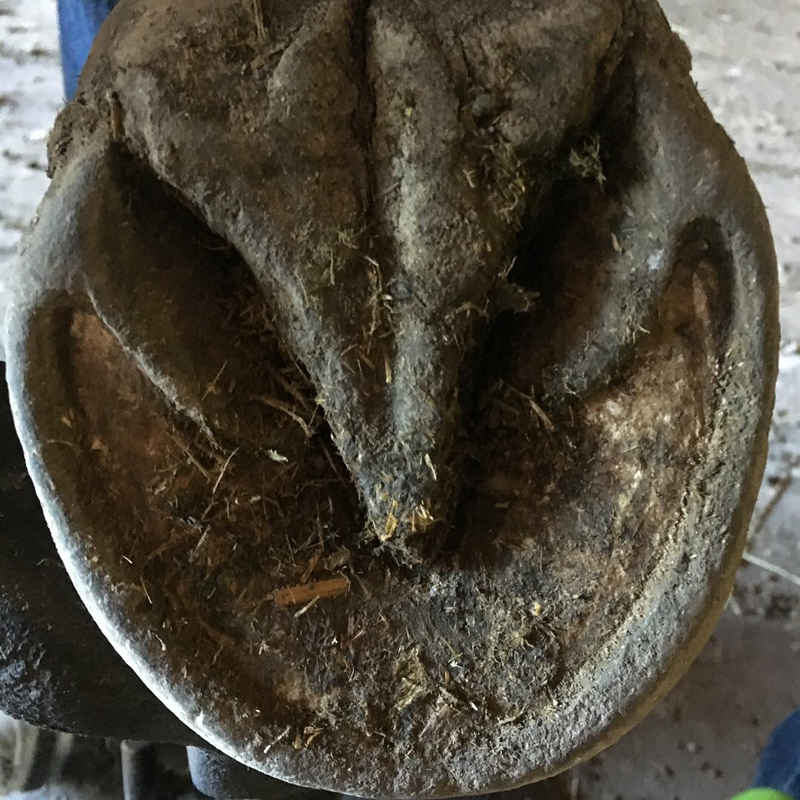 Many horses started barefoot from a young age will never have to deal with arthritis, navicular syndrome or many of the other hoof pathologies that develop from improper hoof mechanics and function. Rarely are any of these pathologies seen in the wild. Domestic horses should move functionally the same as a wild horse. They should strike the ground heel first and allow the shock absorbing functions in the hoof to dissipate the energy. Wild horses wear their hooves constantly because of the abrasive terrain that they live on and because they move 20-40 miles every day. 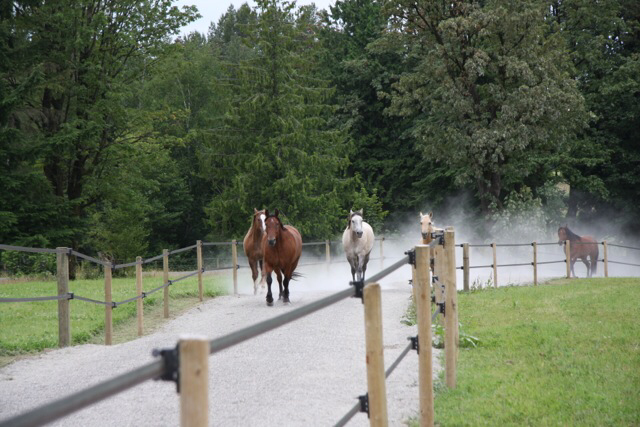 Our domestic horses generally don’t get worked enough on varied terrain to wear their own hooves effectively. It is up to us to keep them trimmed and balanced to allow the hoof to function mechanically how it is intended. Because they are anatomically the same, I believe the wild horse makes a great model for trimming our domestic horses. We must have realistic expectations however in comparing our domestic horses to the wild horse in terms of their capabilities. In the right circumstance they are one and the same, but to take a domestic horse that lives in a soft dirt paddock and ask him to traverse the rocky terrain of the wild horse would be unfair. We must condition our horses to the environment we want them to perform in. That means that if we want our horse to be comfortable on rocky ground we need to allow him to live on rocky ground. With proper trimming and care his hooves will callous and strengthen and he will be able. In cases where it is not possible to condition the horse hoof protection is needed. 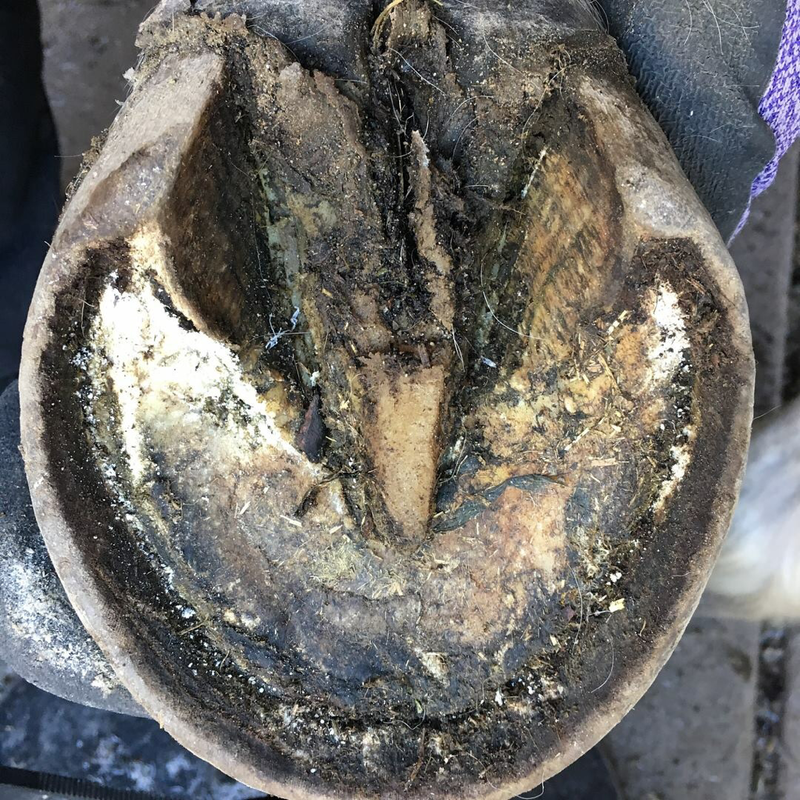 Many horses develop hoof pathologies as a result of improper hoof care, living conditions or ill health and these hooves need extensive time for rehabilitation. In most cases the horses’ comfort level can be improved, it is only in severe cases that pain management becomes the primary focus. 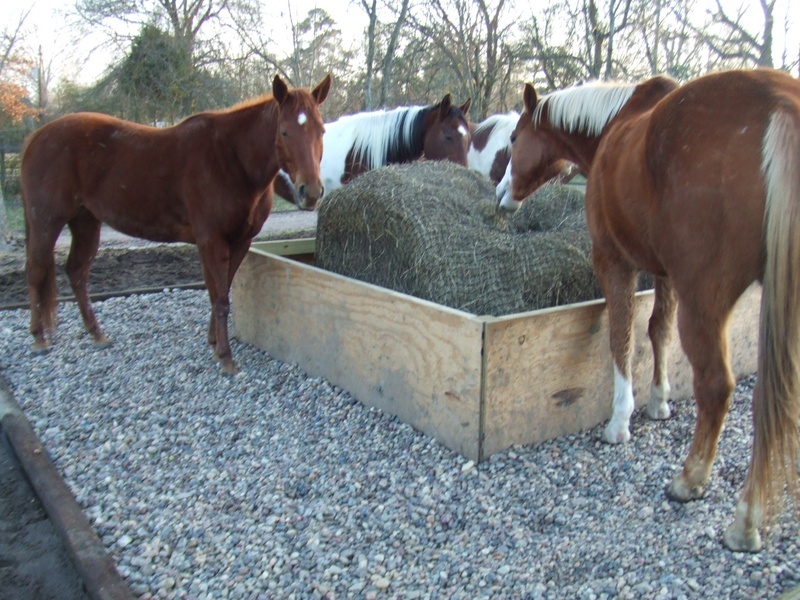 You would never see these horses in the wild as they would not survive on their own, it is only with our help that they can be rehabilitated or managed. Ironically if they had been born wild instead of into domestication, it is unlikely they would have been afflicted with these pathologies in the first place. 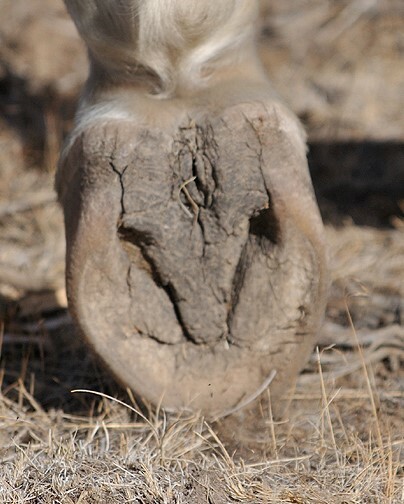 A wild Mustang hoof, completely untouched by human hands. Thanks to Jeff Dixon for the photo. When I started my journey as a hoof care professional, I strived to learn all that I could, and to always keep the horses' best interest at heart. I called myself a barefoot trimmer, because I was adamantly opposed to the use of shoes on horses. The benefits of barefoot are many, but the most important are: increased circulation and flexion of the hoof and increased dissipation of impact forces during movement. As I started to trim professionally and see a variety of horses, I was very concerned with the unhealthy hooves I was finding. It wasn't that the shoes were ruining the hooves, but rather it was the distorted hooves under the shoes that was the problem. If the hooves were healthy to begin with, perhaps they wouldn't need a shoe for comfort. The shoe was simply a tool used to keep the horse comfortable while his hoof was perpetually distorted. I began to specialize in horses with distorted feet that relied on shoes for soundness. I pulled their shoes and rehabilitated their hooves so that they could be barefoot. This worked well for many of the horses I saw, but still a few went back to shoes as they could not cope barefoot. I was doing what I could to rehabilitate their hooves, but it left them with no hoof protection, weak hooves, and unsound for riding. Horses that were able to be used before were now sitting in their paddocks. Surely there was a better way to transition them to healthier hooves without the discomfort? I began to look at alternative hoof protection in the form of hoof boots. There are some very good boots on the market built for all kinds of riding and comfort. And while boots work great for many horses that need added protection, they don't work for them all, and not all owners have the time or desire to use them. This is where shoes become a useful tool. However, there are drawbacks to the metal horseshoe. It is too rigid, taking away the flexibility of the hoof, and without the expansion and contraction during movement circulation is reduced. The shock absorbing properties of the hoof are minimised and added stress is put on the joints and muscles. It does not seem natural to me given these drawbacks to put a metal shoe onto a hoof. But there is a product on the market that is the best of both worlds. It is a flexible plastic shoe that provides the needed protection for some horses, while still allowing the natural movement of the hoof. These shoes are a great tool to use while transitioning horses bare, or for horses that cannot adapt to being barefoot in their environment or circumstance. I can no longer say that I am a barefoot trimmer as I routinely put these shoes and boots on horses that need added protection. They are not barefoot, but they do have a natural hoof working for them with all the advantages. It truly is working for the horse when you can go outside of your comfort zone to seek what is in their best interest. Hoof care professionals need to work together to educate and learn from each other. Regardless of what we call ourselves: natural trimmers, farriers or barefoot advocates, we all have the same goal; comfort and soundness for the horse.